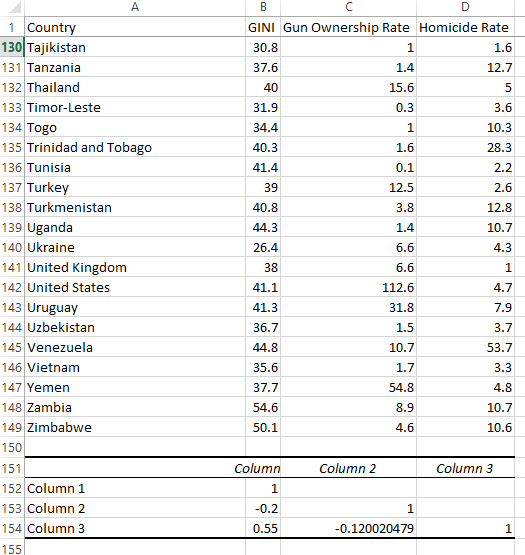 One of the standard talking points of the gun control crowd is that US has the world's highest gun ownership rate, and it also has one of the highest homicide rates among the developed nations - ergo, if we were to ban guns, many lives will be saved. Unfortunately, it is not as simple as that. The legal landscape of firearms ownership in the US is anything but uniform - some states have really heavy restrictions on gun ownership, some are much more lax. For example, Switzerland has much less strict laws than the State of Washington (no universal background check; long guns don't require background check at all), yet its homicide rate is almost an order of magnitude less than that of the US. On the other end of the spectrum are Russia (where buying a gun is almost impossible), and Mexico (very, very difficult), yet their homicide rates are twice and five times that of the US, respectively. Clearly, there's got to be another driver for violence (note that I am talking about all violence, not just gun violence; obviously if you take away guns, gun violence will be reduced, but knife violence will jump right up to complensate, as Australian example demonstrates). One thing that is very, very different between the US and the rest of the developed world is the level of inequality. We are basically two countries in one - a very rich one, just like Switzerland, and a very poor one, much closer to, say, Russia. And of course it is easy to observe that majority of violent crime happens in poor neighborhoods - for example, Chicago Police Commissioner ascribed 80% of Chicago homicides to gang activity). Could it be that the inequality is really a driver for the violence levels in the US? Thanks to some kind and brilliant developer, Internet Explorer on my computer had "download to Excel" functionality, so, within 30 seconds I ended up with these 3 Excel spreadsheets. GINI Coefficient is a common measure of inequality, so that's the one I would use to correlate with the rest of the data. You can read more about it on Wikipedia. I am no Excel wizard, so instead of doing it in Excel UI, I spent 15 minutes on a quick program to extract the data from 3 spreadsheets and combine them into the fourth. If you can read C#, enjoy! As you can see, there is little correlation between gun ownership rate and the homicides (it appears slightly negative, but it is just noise). There is, however, a moderate correlation between the GINI coefficient and the homicide rate. So inequality is a much better predictor of violence than gun ownership.